Al Gore is invited to select any currently available fully disclosed climate model to produce the forecasts (without human adjustments to the model’s forecasts). 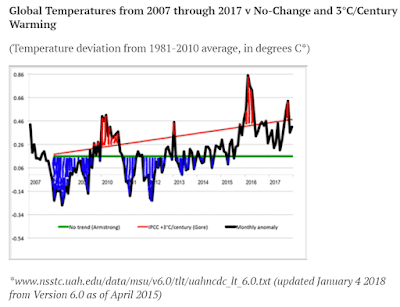 Scott Armstrong’s forecasts will be based on the naive (no-change) model; that is, for each of the ten years of the challenge, he will use the most recent year’s average temperature at each station as the forecast for each of the years in the future. The naïve model is a commonly used benchmark in assessing forecasting methods and it is a strong competitor when uncertainty is high or when improper forecasting methods have been used. Starting at the beginning of 2008, one-year ahead forecasts then two-year ahead forecasts, and so on up to ten-year-ahead forecasts of annual “mean temperature” will be made annually for each weather station for each of the next ten years. Forecasts must be submitted by the end of the first working day in January. Each calendar year would end on December 31. Terms of the challenge can be modified by mutual agreement. More recently he changed it from surface temperature to lower troposphere temperature as recorded by UAH. I don't know exactly when he decided to give up surface for lower troposphere, but it was very recently going by Wayback Machine records, some time between 15 September 2015 and 2 March 2016, probably January 2016. Never mind. J Scott Armstrong and his ally in denial, Kesten Green, didn't do at all well with their bet that there'd be no change in global temperature, whether surface or lower troposphere. Here are some comparisons. The linear trend for the ten year period is 4.35 °C/century. The actual difference between 2008 and 2017 is 0.38 °C. Below is the same plot for HadCRUT, Armstrong's initial choice. The linear trend for the ten year period is 3.68 °C/century. The actual difference between 2008 and 2017 is 0.28 °C. Then there's the 2016 revision of the "bet" that wasn't. 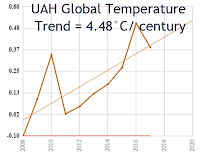 The change in UAH lower troposphere temperatures over the period. Version 6 of UAH was released in April 2015, and it's the only version that covers the period from January 2008 to December 2017. Version 5.2 would have been the current version at the time the bet was conceived, and it looks as if that was last published in 2010. Version 5.6 stops at July 2017. The linear trend for the ten year period is 4.48 °C/century. The actual difference between 2008 and 2017 is 0.48 °C over the period. So, by whatever measure, J Scott Armstrong lost his would-be bet. I wonder why Anthony Watts posted that strange article, given he's a global warming denier. His article had a question as the headline: Tipping point 10 years on: Who won the Armstrong-Gore ‘bet’ on the climate? I guess that J Scott Armstrong and Kesten Green (his partner in crime) were expecting somewhere between the A1B scenario and the A2 scenario. A 150-year simulation of the bet suggested that his chance of winning was only about 70%. In the end, the bet was offered, and monitored, on the basis of satellite temperature data from the University of Alabama at Huntsville (UAH). As I pointed out earlier, the "end" looks to have been about eight and a half years after the original ten year bet was proposed. Some sad end :( He should have stuck with HadCRUT, because that showed the smallest increase and the lowest trend over the period. Figure 4. Graphic from WUWT showing just how bad the Armstrong projection turned out to be. Longer is better for assessing climate forecasts, and so theclimatebet.com site will monitor the “bet” in line with Scott Armstrong’s offer to extend the challenge for another ten years by sticking with the original 2007 annual average global temperature as the starting point. Extending the bet is intended to help further publicize the important role of scientific validation of forecasts that influence public policy. Policymakers should reject forecasts that fail to reduce errors compared to an appropriate no-change benchmark. See below. 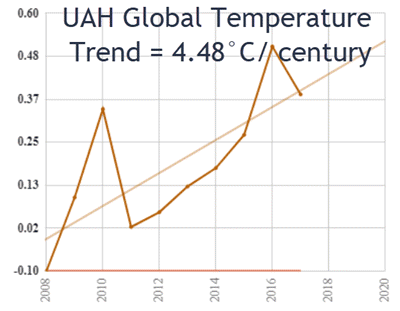 The UAH slope for the period was 0.45°C/Decade. Armstrong/Green would have lost on any accounting. By a mile. As usual, you are writing before thinking. Do you believe anyone in his sane mind really cares what you write? Not even your fellow warmunist cultists do. All good points which mean ‘nothing’, for the author is fighting on the wrong battlefield. St Gore claims were very about science nor facts, they never are. It’s PR and BS all the way, that and ego with personal enrichment. And the really bad news is, he won those bets. So in a clumsy attempt at character assassination Mr Green gives himself an uppercut. All good fun. Look what has happened to the late Bob Carter, Jennifer Marohasey, Prof Peter Ridd, Willie Soon, Judith Currie and numerous other wise people who have strived for the truth to be told and for the science to be objectively debated. This left wing monster is something to be very fearful of. I tried to read the WUWT article but it really is a rambling word salad that uses a lot of words to confuse the whole thing. The article and the comments just shout desperation. I am amazed Watts thought it was a good idea to publish it. I am confused: any climate change denier who wants to bet on no global warming can do so at "Cool Futures" courtesy of Monckton et al. Its almost as if they all think "Cool Futures" is yet another pile of denier doggy do. Yes, it's an amazingly poorly written article (by Kesten Green). But they are well connected. Thir fantasy has has a run on Fox News and The Australian. AFAICS, in claiming a win, they have miscalculated the OLS trend by a factor of three. Sou is right at about 4.35 °C/Cen (I get 4.5 on a monthly basis). They say 1.53 °C/Cen. Pretty odd for "forecasters". For fun I've produced a scoreboard of climate bets. I've included all the ones that I can find where terms were agreed by both parties and made public. The current score is 7-0 to the IPCC-friendly / Consensus / Warmist side - that's four completed and three still underway. The closest to a win for the Contrarians / Coolists was Whitehouse vs Annan. Whitehouse narrowly won using HADCrut3 (which was in use at the time), but Annan would arguably have won with HADCrut4. So I've called that a draw for now. I'm happy to post somewhere if anyone's interested. Deeenngee, go for it. You can post the pertinent details here. I am interested because I find it hard to believe the anti-Warmists scored one, even arguably! That's great - thank you, Deeenngee. It's a bit crude and wonky at the moment - I need to find the best way to insert a table on Blogger which doesn't go weird on the published page...refinements to follow. Perhaps some pointers to the actual bets and a line or two of your analysis would enhance it. "Scott Armstrong’s forecasts will be based on the naive (no-change) model; that is, for each of the ten years of the challenge, he will use the most recent year’s average temperature at each station as the forecast for each of the years in the future." That is a good PR bet. The people who are willing to pretend to be stupid for their political cause can claim the bet is about no warming. Actually the bet is about a lot of warming. By each time taking the last year, the warming is baked into the bet. If Armstrong really did not expect any warming he could have taken the temperature of the first year as the comparison temperature. With a warming that is on global average about 2 degrees per century (which is 0.02 °C per year) and making the bet about station data, which has a noise level of about 1 °C, the bet is actually coin flipping and Armstong has a good chance of wining while the Earth is warming fast. P.S. Those WUWT comments are atrocious. In the Age of Trump they seem to have given up any pretense to be more than a tribe of uglies. Not caring about whether what you say makes sense works for Trump. Looks like they got inspired. Layzej - thanks for those links and I see from the first that James Annan paid up. I guess that's conceding under wager etiquette and as far as we know David Whitehouse didn't void the bet when HadCRUT4 came out shortly after! On that basis I've changed the scoreboard to a win for the Coolists. I've kept & amended the footnote though and generally improved the layout. Off topic, but the latest version of reality from the fossil fuel industry and its muppets is that global warming is happening but all those experts who have looked at its effect are wrong because Scott Pruitt knows better. That's a load off then. If you could, it would be nice to include links to blogs that discuss the bets. Here, for example, is Chris Hope's one: http://www.chrishopepolicy.com/2016/07/making-a-safe-bet-on-dangerous-climate-change/ and I think the progress of Rob Honeycutts one is described on SkS. I think it could be an interesting and useful resource. Another avenue would be to list, like the one at WUWT, bets that weren't taken up. James Annan tried to make a bet with Terence Mills over a really dodgy statistic prediction, but Mills clearly didn't have much confidence in his own prediction (despite it being reported in The Times (UK). I'm a little late to this, but I wanted to add some comments about Kesten Green's statistical flim-flammery in the WUWT article. This is in addition to other criticisms, such as cherry picking the data set and modifying the rules of the "bet" after the "bet" began, as others have discussed. 1. One fundamental assumption of linear regression is that the noise is uncorrelated. This is obviously not true for this data. What this means is that any error computations are inherently incorrect. Therefore none of the conclusions that Kesten Green comes to have any validity. 2. This one will take some explanation. The method typically used for linear regression is known as Ordinary Least Squares (OLS). Mathematically, what the method does is choose the model which minimizes the Mean Square Error (MSE) computed by comparing the model fit to the observed data. When assessing the predictions of a model, it is reasonable to compute the MSE comparing the predicted values from the model against the new observations. However, MSE is not the only possible way to evaluate the model fit. There are various other ways to compute this, including using absolute error instead of square error. Green links to an article which argues that when choosing a model based on prediction, absolute error is superior to square error. This is an interesting claim and I would like to spend some time going over the linked article. I do admit, however, to a little suspicion about that article because it turns out that J. Scott Armstrong is one of the coauthors. One obvious consequence of using absolute error as opposed to square error is that the impact of the 2016 El Niño on the error calculations is greatly reduced. This has obvious appeal to Green because it means that the penalty for not predicting the 2016 El Niño is much smaller when computing absolute error rather than square error. 3. We also need to examine the choice of models. Armstrong's model is that temperature is constant. 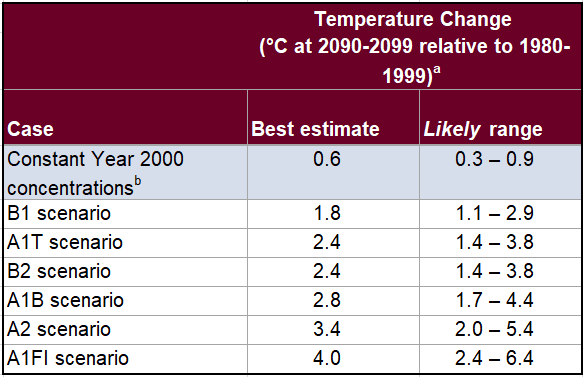 As a choice of constant temperature, Green uses the average temperature over 2007. For the "IPCC/Gore" model, Green uses a trend of 3 degrees per century. 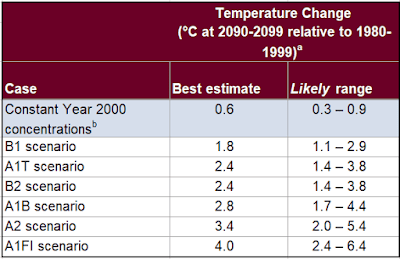 However, the trend also needs an origin, and Green uses the 2007 average temperature as the origin. I am not convinced that this is a good choice for the origin, but I also don’t have a recommendation for a better choice. Incidentally, the comments on Nick’s post have a discussion of Green’s use of the origin in the regression fit and resulting conclusion that the slope is 1.5 degrees per century, rather than Nick and Sou’s computation of 4.5 degrees per century. In summary, Green's analysis does not correct for autocorrelation, which invalidates all of the conclusions of the analysis. Leaving that aside, the analysis relies on absolute error rather than square error. While this may be justifiable, it can't be denied that absolute error gives much better results for Armstrong's predictions than square error would. Leaving that aside, the choice of the origin for the 3 degree per century prediction is arbitrary. Green's conclusions are highly sensitive to the choice of origin. Taken together, it's clear that Green's analysis has no value.